The nut pâté, nori, and zucchini in this no-fish “sushi” recipe are all IBS-friendly because of their soluble-fiber content. If you’re in a rush, you can substitute avocado for the nut pâté. If you’re worried about digesting the carrots, either eliminate them or shred them with a vegetable peeler. The same goes for green onions — cut them extra fine if you tend to have problems stomaching them. 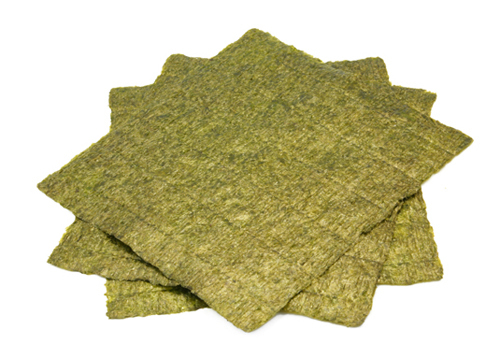 Nori is the dried seaweed paper commonly used in sushi. Chef and nutritionist Shannon Leone provided this recipe. Lay out one sheet of the nori at a time on a cutting board. Spread the nut pâté on the nori sheet and then place vegetables and fruit lengthwise on top of the pâté. Roll the sheet into a cylinder and seal it with a wet finger. Let it stand for 30 minutes and then slice it into 6 pieces. Repeat Steps 1 and 2 for the rest of the nori sheets. Per serving: Calories 85; Fat 5.4 g (Saturated 0.6 g); Cholesterol 0 mg; Sodium 156 mg; Carbohydrate 6.6 g (Fiber 2.7 g); Protein 3.1 g; Sugar 2.5 g.
Every Raw food chef has his favorite nut pâté, but all the recipes begin with the basic five ingredients: nuts or seeds, lemon juice, garlic, salt, and water. Twelve servings may seem like a lot, but the serving size is 2 tablespoons. It’s so rich and concentrated that that’s the perfect amount for a wrap or a salad dressing. For wraps, make the pâté a thicker consistency like peanut butter; for sauces (such as to pour over pasta), make it a thinner consistency. This recipe will keep in the fridge for several days because the garlic is a natural preservative. Grind the nuts or seeds in a coffee grinder or high-speed blender. If you use a coffee grinder, we recommend grinding 1/4 cup at a time. Set aside the powdered mixture in a bowl. Blend the lemon juice, water, salt, and garlic in a blender or food processor. Add the powdered mixture to the lemon juice mixture and blend. To create the desired consistency, you may have to add another few tablespoons of water and lemon juice. Per serving: Calories 130; Fat 10.6 g (Saturated 1.1 g); Cholesterol 0 mg; Sodium 291 mg; Carbohydrate 6.8 g (Fiber 2.5 g); Protein 4.2 g; Sugar 1 g.
The key is to blend the ingredients until you get a rice-like texture. The blending chops through the fiber and makes your meal much easier to digest and suitable for IBS-C, which benefits from both soluble and insoluble fiber. Blend all the ingredients into a food processor and process until the mixture becomes somewhat rice-like in texture. Do not over process. Per serving: Calories 308; Fat 28.3 g (Saturated 2.4 g); Cholesterol 0 mg; Sodium 264 mg; Carbohydrate 12.5 g (Fiber 3.6 g); Protein 6.1 g; Sugar 3.6 g.